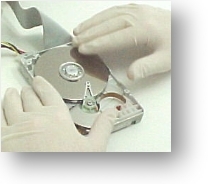 Data recovery is a specialized area. Any attempt to learn the craft should be done on non-essential data devices. Please use our free initial consultation service so that we can help maximize your chances of data recovery. We've made data recovery a speciality and have literally decades of experience stacked up within our staff. If anyone can recover your data, we can! In addition, you may have been shopping around for data recovery services elsewhere and are concerned about the price. For more about the price of our services, visit our pricing page. For a Free Initial Consultation to outline the right plan for your data recovery need, simply contact us through our Help! E-Mail Form to get started on your road to recovery. ©2004-2014 Data ICU All rights reserved. Backup software is available in a variety of forms, both for tape and other methods. If you're not planning to use a tape backup, check out some of the software titles available in computer stores. Any software worth its salt will allow you to schedule automatic backup files at a frequency you select. You can use these software solutions to reduce the data to a single backup file of a size that will fit on some sort of removable media (Zip, Jaz, removable hard drive, Read-Write CD's, etc.) Typically, using the non tape method, you would create a backup file on your hard drive. Once complete, copy the backup file to your removable media. About us: DataICU.com is a long-standing provider of "data recovery services" on the net. Since 1993, we have been providing the Internet community with fast quality lost data retrieval services. We support all types of lost data retrieval services for hard disk drives, notebook disk drives, floppy drive diskettes, Zip drive disks, CD media, tapes, flash cards, virtually everywhere data is stored; we can help recover and rebuild your data. Therefore, if your looking for the fastest hard drive recovery service, we invite you to bookmark now. - Thank you!